Coming from Pennsylvania (even the other side of the state) I’m familiar with the Johnstown Flood. This entered heavily into my decision to request the novel; in addition its concept itself seemed promising. Kathleen George seems known for her mystery/crime genre writing, so this is a departure from her normal literary pool. 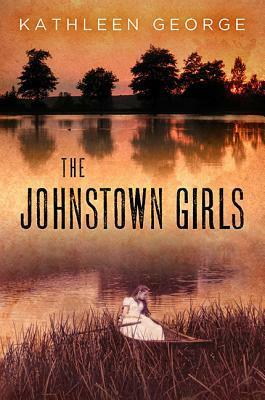 “The Johnstown Girls” is an exploration of three female protagonists, linked together through a shared region of birth. Set in part in the present, Nina returns to her hometown with her boyfriend Ben, a fellow newspaper reporter doing a feature on the anniversary of the catastrophic Johnstown flood. Together they interview Ellen, one of the last surviving flood survivors and learn of the mysterious loss of her sister May (Anna). We the reader then are shown that the sister has survived, with few memories of the disaster, no knowledge of her true origins and relations. Despite the literary shift then, this still has elements of crime and mystery in minor ways, displaying George’s touch and appreciation for the genre. For the elderly Ellen and May/Anna, the narrative is split between present day and recollections of the past from their separation at the flood through the decades following. The novel is therefore historical in its backdrop and link between past and present narratives. Leading similar, but quite distinct lives of circumstance, Ellen and Mary/Anna display a shared kindness and intelligence, and a progressive independence that make them strong and decisive characters. They thereby reflect an optimistic example born from experience that mirrors Nina’s precarious situation in her own life still relatively early in progress, trying to make a relationship with Ben work. This contrast is evident to the reader between Nina and either sister, though to Nina only in regards to Ellen who she has met, driving her to help and determine the truth of what happened to May/Anna those many years ago and where she is now. This overall theme of the story works tremendously well. The trio of female protagonists are fascinating, complex, and touchingly real. The verisimilitude of character, the contrast between the elder sisters’ optimistic certitude and Nina’s uncertain fears make the relations in the novel work emotionally, bright without any false rosy perfection. This authenticity is helped by the historical framework of the flood and the photos of real average people who lived through the event that George peppers between chapters. Despite these strengths there are aspects to “The Johnstown Girls” that seriously detract from it. The primary difficulty is the Ben-Nina relationship. Though it complements/contrasts the relationships and experiences of the elder sisters, this doesn’t crystallize until the end. For much of the novel the scenes between Ben and Nina seem superfluous, particularly when extending to Ben’s family. Some of these portions could be left out probably, but at the very least the organization of the novel between multiple protagonists/relations across two times could have had connections strengthened via reorganization. Secondly, to augment the ‘historical’ nature of the novel, ‘copies’ of Ben’s articles are reproduced, largely repeating information already conveyed in the main narrative, or revealing information that could be better revealed through character interactions. The regional familiarity of this novel for certain readers and an interest in the Johnstown flood make this a worthwhile read. For those that really appreciate novels with strong female characters and the travails of realistic relationships you will likely enjoy this a great deal, enough to look past the imperfections of the novel’s construction, much as the situation is in human interactions.